What in the world is causing the Retail Meltdown of recent times? In the middle of an economic recovery, hundreds of shops and malls are shuttering. There have been nine retail bankruptcies in 2017. J.C. Penney, RadioShack, Macy’s, and Sears have each announced more than 100 store closures. Sports Authority has liquidated and Payless has filed for bankruptcy. So, what in the world is going on? Mobile shopping, once an agonizing experience of typing private credit-card digits in between pop-up ads, is getting easier thanks to mobile apps and mobile wallets. Since 2010, mobile commerce has grown from 2 percent of digital spending to 20 percent. People used to make several trips to a store before buying an expensive item like a couch. They would go once to browse options, again to narrow down their favorites, and again to finally pull the trigger on a blue velvet love seat. On each trip, they were likely to make lots of other small purchases as they wandered around. But today many consumers can do all their prep online, which means less ambling through shopping centers. Mobile Retail commerce predictions – 2017 to 2021. 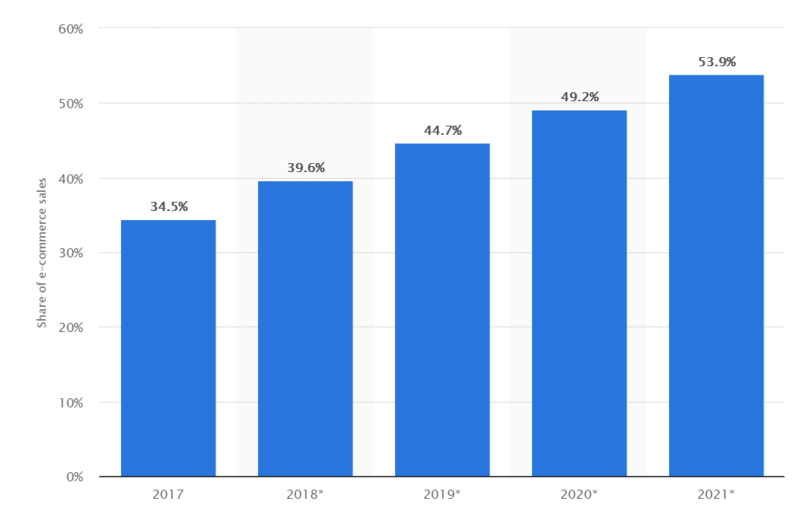 This statistic gives information on the U.S. mobile retail commerce sales as percentage of total retail e-commerce sales from 2017 to 2021. In 2021, 53.9 percent of all retail e-commerce is expected to be generated via m-commerce. The number of consumers using mobile apps is growing exponentially, and customers who use your mobile apps are often your most valuable buyers. Alibaba recently revealed they make more money from their mobile customers (all 427 million of them) than from their non-mobile customers. Alibaba isn’t alone. eBay announced that $9.5 billion of their sales in Q2 of 2016 came from mobile. Annual retail payments on mobile handsets and tablets are expected to reach $707 billion by 2018, representing 30% of all eRetail by that time. Today, mobile is the most important digital touch point for retailers to win, serve, and retain customers. Smartphones enable consumers to access the internet from anywhere at any time, empowering them to interact with brands in whatever context they choose. They expect to be able to discover, explore, buy, ask, and engage with retailers in context and moments of need, and retailers must deliver mobile experiences that match and exceed those expectations. 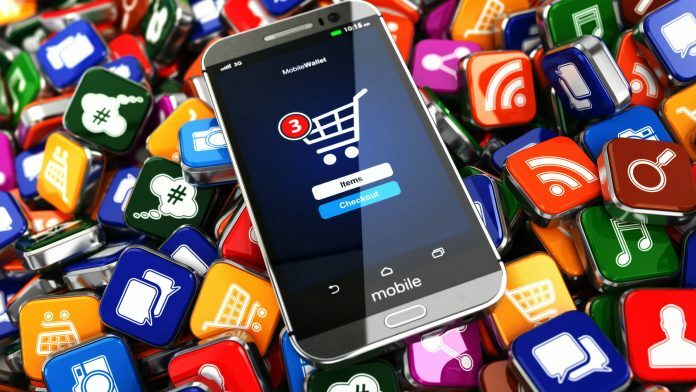 Here are few instances of successful retail mobile apps. 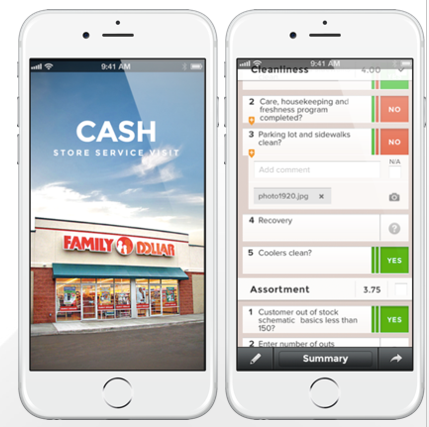 Family Dollar, a retailer that provides value and convenience to customers in easy-to-shop neighborhood stores needed to modernize store management streamlining internal operations, creating more elegant and efficient automation processes and turned to Axway for unified app development and enabled building the Cash App helping managers keep tabs on metrics that affect in-store performance such as how shelves are organized, average prices compared with the competition, and how employees meet certain customer satisfaction measures. Smartphones are changing the way that consumers shop and interact with retailers, both online and in stores. The ability to research products, look for coupons, and purchase in a moment of need, regardless of location, is empowering consumers. 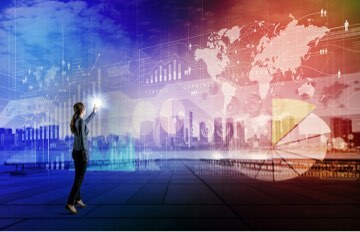 Forrester calls this the mobile mind shift, and retailers need to fundamentally change their mobile strategies to drive marketing and business outcomes as a result. 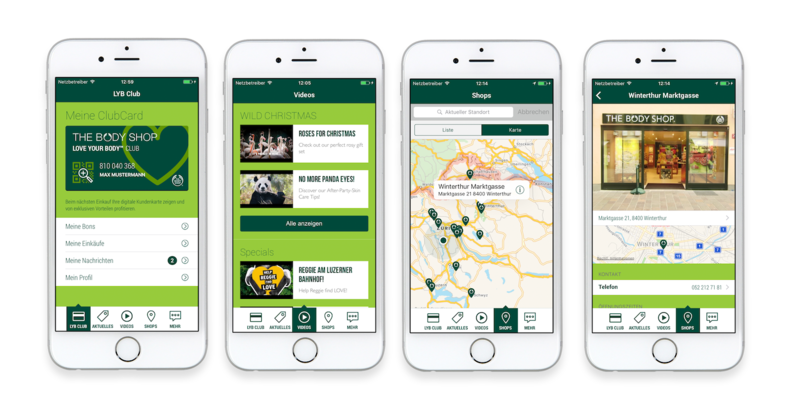 Make sure you choose a Mobile App development platform that helps you deliver the best digital experience for your retail customers and a technology that lets you measure and manage your retail app performance. Shravanthi Reddy is a Product Marketing Director for App Dev solutions at Axway.